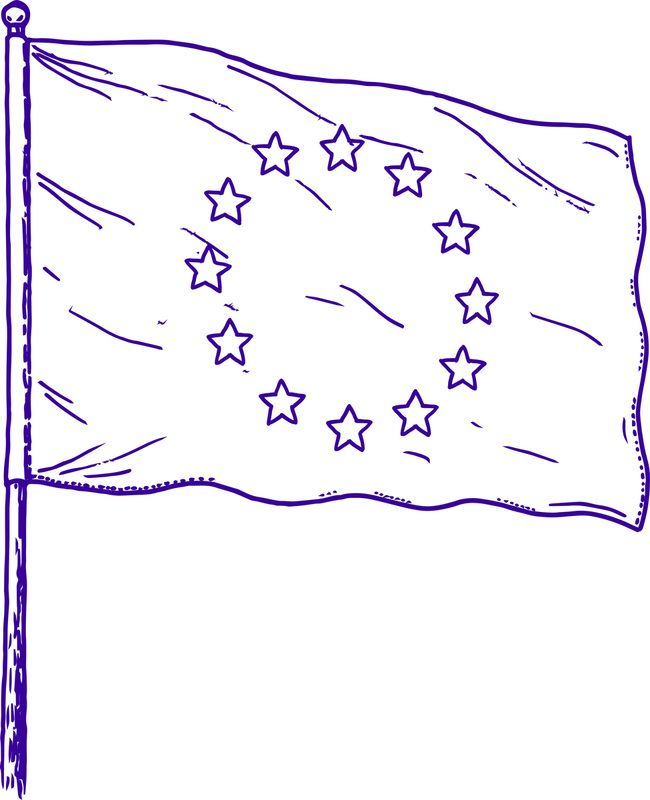 On 12 March 2019 the EU issued an updated list of non co-operative tax jurisdictions (commonly referred to as the ‘EU tax blacklist’) and added the UAE and Oman along with eight other jurisdictions to the previous EU tax blacklist of five countries. This article sets out the background and discusses the implications of the blacklist for businesses operating and seeking to invest in the UAE. The EU published an initial tax blacklist of 17 countries including the UAE and Bahrain on 5 December 2017. At that time, Oman and Qatar were included on a watch list of jurisdictions that had committed to change their tax rules to comply with EU requirements and would be monitored based on these commitments (known as the ‘grey list’). However, on 23 January 2018 and 13 March 2018, the UAE and Bahrain respectively, together with 10 other countries, were subsequently removed from the EU tax blacklist and transferred to the ’grey list‘ based on commitments that were made by these countries to meet EU standards. Unlike five countries that made no commitments to the EU, both the UAE and Oman were transferred to the current EU tax blacklist not due to lack of commitment but rather the time it has taken to implement the commitments previously made to the EU in 2017. The UAE had committed to enact substantive legislation on local substance requirements (i.e. the minimum level of presence required in the UAE in order for an entity resident in the UAE to qualify for benefits under a double taxation treaty concluded by the UAE) by 31 December 2018. Oman had committed to implement the automatic exchange of information and ratify the OECD Convention on Mutual Administrative Assistance in Tax Matters (‘MAC’) by the same date. However, both the UAE and Oman were unable to deliver on this promise by the agreed deadline and the subsequent monitoring period (which had been extended to February 2019) and thus were added to the blacklist. Currently, 34 countries are on the EU ’grey list‘ and these jurisdictions will continue to be monitored for progress based on commitments made in 2019. It is understood that around 25 countries were removed from the previous ’grey list‘ and are now considered to be ’co-operative jurisdictions‘ after they made changes to their domestic laws to meet tax transparency requirements, fair tax competition criteria and the OECD’s Base Erosion and Profit Shifting (‘BEPS’) minimum standards. Implementation of anti-BEPS measures: A commitment to implement the OECD’s BEPS minimum standards. It is important to note that the EU blacklist and grey list are not fixed and will be monitored and updated at least on an annual basis. Countries on the blacklist that bring their tax systems fully in line with the EU’s good tax governance criteria may be de-listed while other jurisdictions on the grey list that fail to deliver on commitments to the EU by the agreed deadline may be transferred to the blacklist in the future. The EU will also assess whether any other countries should be included in the EU listing process. It is possible that the EU tax blacklist may expand this year due to stricter transparency requirements that will be imposed by the EU from June 2019. The EU blacklist is not the first ‘tax blacklist’. In July 2018, at the request of the G20, the OECD also prepared a limited ‘blacklist’ of countries that failed to meet international transparency standards. However, the EU list is based on broader criteria and covers fair taxation and compliance with BEPS standards in addition to the requirement of transparency. Some individual EU Member States including Spain, Belgium, Italy, France and the Netherlands and other countries like Brazil and Mexico also have their own domestic blacklists of non co-operative tax jurisdictions. In 2015, the European Commission (‘EC’) published a ‘pan-EU’ blacklist which was a consolidated version of the individual lists in EU countries rather than a list agreed by all EU countries. However, the EC suggested that a common EU list would be a more effective way of encouraging fair tax competition and clamping down on abusive tax practices employed by various countries. In addition, a single EU blacklist would add more weight than arbitrary individual blacklists adopted at the Member State level based on varying criteria. The UAE has made significant progress to bring its domestic tax system into line with international standards and enhance transparency as well as facilitate the exchange of information for tax purposes. The UAE has a wide tax treaty network with over 80 double taxation treaties in place with other countries and many of these treaties already contain provisions on the exchange of tax information on a bilateral basis. The UAE has also implemented the Common Reporting Standard (‘CRS’) for the automatic exchange, amongst tax authorities, of financial account information of foreign tax residents. In this regard, the UAE signed the MAC on 21 April 2017 and ratified the same in April 2018. In July 2018, the UAE signed and subsequently ratified the Multilateral Competent Authority Agreement (‘MCAA’) to complete the implementation of the CRS and to facilitate compliance with various BEPS transparency measures including the exchange of country-by-country reports under BEPS Action 13. The UAE also committed to the first exchange of information under the CRS by September 2018 and, in line with this commitment, shared information with 41 countries during 2018. The UAE also became a BEPS inclusive member in May 2018 committing to the implementation of four minimum BEPS standards and a signatory of the MLI on 27 June 2018. Bahrain also ratified the MAC and MCAA and provided information to 37 countries in 2018 and became a BEPS inclusive member in 2018 which led to its removal from the blacklist. The EU tax blacklist will have an impact for the blacklisted countries and for companies seeking to do business in or through those countries. There are reputational issues for countries included on the blacklist and companies may be reluctant to use structures, enter into transactions and/or invest in or via the blacklisted countries which would impact inbound investment into those countries. There is also a risk that individual EU countries, as well as other countries, may use the EU tax blacklist as a basis for their own blacklists. The EC has encouraged EU Member States to agree on co-ordinated sanctions to apply at national level against the listed jurisdictions. At the individual Member State level, a set of administrative and legislative tax counter measures have been agreed. Administrative tax measures include increased monitoring of transactions and more audits for taxpayers benefitting from such regimes or using structures via the blacklisted countries. Legislative tax measures include non-deductibility of costs, controlled foreign companies’ rules, withholding tax measures, limiting any participation exemption, special documentation requirements and anti-abuse provisions. Additional counter measures are in place at EU level. EU legislation restricts certain EU development and investment funds from being channelled or routed through entities in the blacklisted countries. Further, under EU’s Directive on Administrative Cooperation in the field of taxation (‘DAC 6’), there is a requirement to disclose and exchange information related to certain transactions between associated enterprises that are resident in an EU or blacklisted jurisdiction including cross-border payments between such enterprises. Finally, the country-by-country reporting includes stricter reporting requirements for multi-nationals with activities in the blacklisted countries. Is the Approach of the EU Fair? Whilst the EU’s listing approach is transparent and will no doubt facilitate fair tax competition globally, the EU must apply the same standards to all countries on a uniform basis in order to gain universal acceptance. EU Countries were excluded from the scope of the EU listing process because the focus was on external threats to the tax base of EU Member States and so only non-EU countries dealing with the EU Member States were assessed. It is possible that some EU countries would have been blacklisted if they had been screened and subjected to the same criteria applied to non-EU countries. The list may also not be complete at this stage because developing countries, without financial centres, were either completely omitted or given more time to address their shortcomings and countries with constitutional restraints were also given additional time. There was also discussion on the status of the US because it has not signed up to the CRS and so does not strictly meet the EU’s tax transparency requirements however, it is currently not included on the backlist. The EC has indicated that all countries that have not adopted the CRS or have bilateral treaties with all EU countries will be automatically blacklisted in 2019 due to more stringent transparency requirements which will be applied from June 2019. It remains to be seen whether this will be the case. It is also worth noting that the EU and the OECD have been introducing measures to tackle international tax avoidance and a key driver of these measures has been multi-national companies headquartered in more established and mature western tax jurisdictions that were perceived to be reducing their overall tax burden by artificially shifting profits from high tax jurisdictions to jurisdictions with a low rate or no tax rather than companies from countries in the Middle East. By comparison, the tax regimes across the Middle East are relatively less sophisticated and still developing. The UAE is not a tax haven. Unlike many typical tax havens, companies establish and operate in the UAE because it is a regional hub for logistics and operations rather than for purely tax reasons. The UAE has also taken various measures to demonstrate that it is fully committed to being compliant with international tax standards. As noted above, the UAE and Oman were included on the blacklist because they did not implement the commitments made to the EU by the agreed deadline rather than the failure to co-operate with the EU. Due to the complex nature of tax related legislation, it is common in the region for legislation to take time to be introduced. The expectation is that the substance legislation will be finalised by the UAE during this summer and Oman is also likely to take the necessary action shortly. Accordingly, it is expected that both the UAE and Oman should be removed from the blacklist in due course which will be a welcome development. Both the UAE and Oman are expected to address EU’s concerns in the next few months which should pave the way for their removal from the EU tax blacklist. Therefore, the negative consequences for the UAE and Oman are expected to be limited. However, there are a number of action points to be considered by businesses operating in the UAE as a result of changes that will be required to be made to domestic legislation. The EU tax blacklist is constantly evolving. As highlighted above, from June 2019 more stringent transparency criteria will be applied by the EU so all jurisdictions currently on the grey list will be re-assessed to ensure that they are compliant which may potentially result in the expansion of the blacklist. Businesses in the GCC should monitor these developments. The UAE is in the process of introducing legislation on local substance requirements and it is likely that this legislation will not be limited to transactions with the EU. 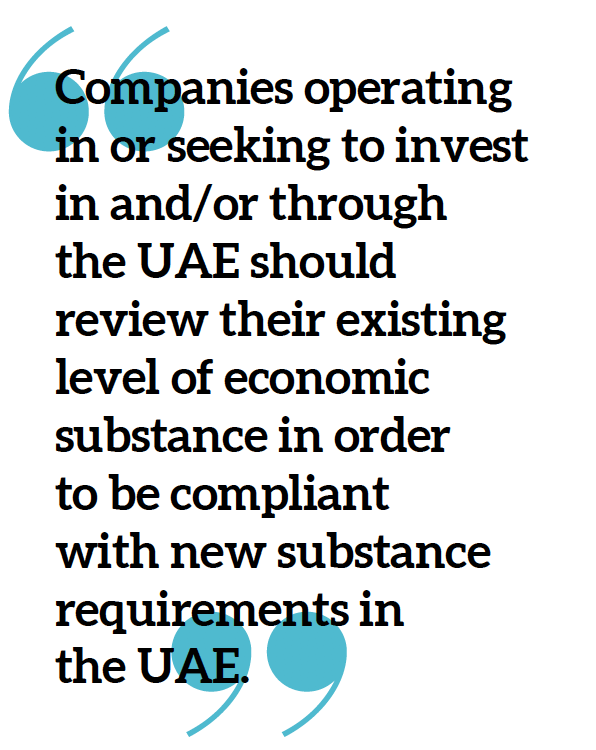 Companies seeking to invest in and/or through the UAE and businesses operating in the UAE should review their level of economic substance in order to be compliant with the future substance requirements in the UAE. Previously, companies in the UAE may have been able to obtain a tax residency certificate based on certain requirements and avail of certain benefits under double taxation treaties which the UAE has in place with other countries. Going forward, additional requirements will likely apply at the UAE level and existing level of operations may not be sufficient to meet the new criteria. In simple terms, this means UAE companies must have a genuine economic activity in the UAE through the presence of employees, important functions and assets etc. Accordingly, is important for UAE businesses to undertake a health check on their existing level of substance in anticipation of the new substance legislation that will be introduced in the UAE shortly. The UAE has also signed the MLI and will introduce new domestic legislation in due course to implement the MLI. In view of the ratification of the MLI by the UAE, based on the final positions taken by the UAE, many of the UAE’s double taxation treaties may be modified. It is important for companies to review their existing structures and assess the impact of the MLI on the UAE’s double taxation treaties and their holding, financing, intellectual property and operational structures. The above considerations are equally relevant for other GCC countries which may potentially follow suit and introduce local substance legislation. In addition to the UAE, Saudi Arabia, Kuwait and Qatar are also signatories to the MLI and, with the exception of Kuwait, all GCC countries are members of the BEPS inclusive framework. As a result of the shifting global tax landscape, in order to be able to access the benefits under double taxation treaties, the maintenance of an appropriate level of substance will be critical in the future. GCC businesses will also have to be mindful of any potential modifications to the double taxation treaties entered into by their country of residence as a result of the implementation of the MLI in the country. Al Tamimi & Company’s Tax team regularly advises on international tax matters. For further information, please contact Shiraz Khan (s.khan@tamimi.com).